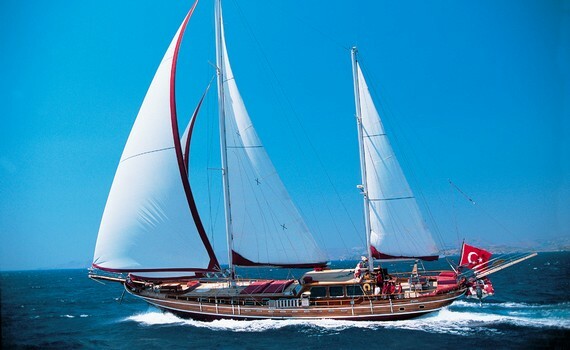 Breathe the scent of history with Gulet charter Bodrum! ...into the nights! With A Yacht Charter Bodrum. With us. What exactly is a Gulet? 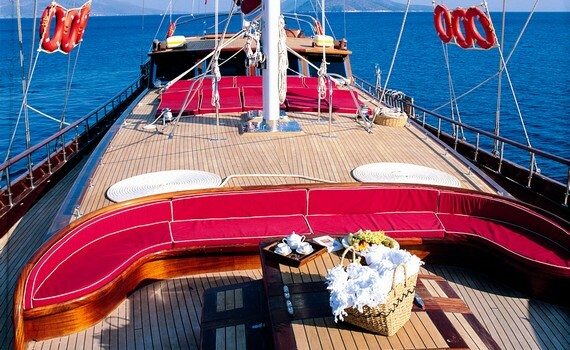 A classic and modern luxury gulet yacht with a beautiful interior design. Accomodating up to 10 guests. 6 spacious cabins can accomodate 12-13 guests. Her captain and crew are well experienced in vip service and customer care. 5 cabin gulet accomodating up to 10 guests. Spacious sun deck area makes it a popular yacht charter. Bodrum is a town that lies on Bodrum Peninsula, on the Mediterranean coast of Turkey. The town has a population of 36,000 people, with another 100,000 living in the surrounding area. The town was already famous in the ancient era. It was the site of the city of Halicarnassus, home to the Mausoleum of Mausolus, one of the Seven Wonders of the Ancient World. Today, together with Marmaris, it is the largest Turkish yacht charter basis. Bodrum takes up the central position on the Carian coast, which is very popular with yacht owners and charterers. That is why the city is an excellent point for starting the journey across the Mediterranean waters of Turkey and the nearby Greece. There are two airports relatively close to the city. The first one, Milas-Bodrum Airport, is situated 36 kilometers northeast of Bodrum. The second one, Kos Island International Airport, is located on the Greek island of Kos, 70 kilometers southwest of the city. The area around Bodrum has the Mediterranean climate, with hot and sunny summers and mild winters. The average temperature in summer is 34 °C and 15 °C in winter. This makes sailing in the area possible all year round. 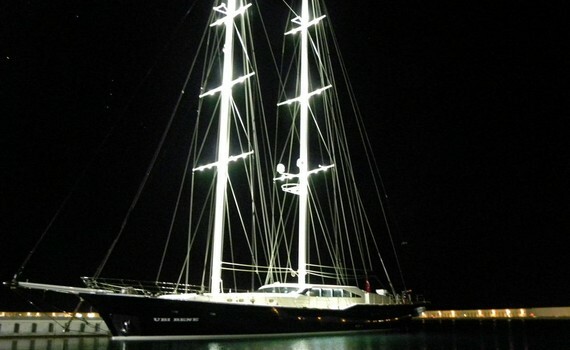 As already stated, Bodrum is the largest Turkish yacht charter basis. You can charter a variety of boats there. One such type of boat is a gulet. A gulet is a traditional two-masted or three-masted wooden sailing vessel that originates from the southwestern coast of Turkey. The production of such ships began in the antiquity, and Bodrum and Marmaris have been the main constriction sites of such type of boat. Gulets are 14 to 35 meters long, are popular for tourist charters, and can nowadays be found across the Mediterranean. There are three types of gulets. The first one is a schooner-type gulet. It is a boat with a large stern area that can receive as much as 16 persons. The second type is a ketch, with a raised, square-off stern. This vessel can receive 8-24 persons. Finally, the third type of gulet is the Tirhandil, an old type of vessel with a pointed stern. Due to its traditional design, this type of gulet can receive only up to 6-8 persons, but with plenty of deck space and attractive appearance, they offer an excellent sailing experience. 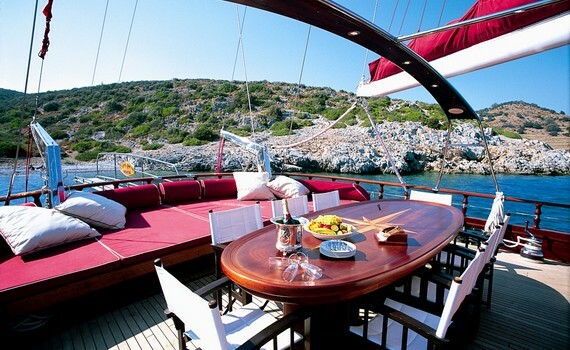 Chartering a gulet in Bodrum offers you an opportunity to experience the beauty of the southwestern Turkey. One excellent sailing route is from Bodrum to Marmaris. Between the two towns, there are many places worth visiting, such as Datça, Selimiye, Loryma, Göcek, etc. Marmaris is a sailing and diving center, and a popular destination for cruising in winter. The town offers a spectacular nightlife, allowing tourists to end their sailing journey in style! If you have chosen a gulet cruise for your vacation and want to know more about it, visit our other pages and gather additional information. Check out Gulet Cruise Selection and discover how to find the best gulet for a perfect cruise, get acquainted with the gulet's equipment and find out what a typical day aboard this amazing yacht looks like. Read more about the top spots for gulet charter and discover how delicious gulet cuisine can be. Enjoy the comfort of this traditional yacht and have the best time!